For those of us who live too far from Yellowstone to make it practical to take bikes along when we visit, there are now bikes for rent in Old Faithful Village. The concessionaire Xanterra announces that “the bike shop at Old Faithful Snow Lodge offers hybrid bikes for rent to help make your Yellowstone bike riding even more pleasant. Helmets, racks, bike trains, trailers, jackets, gloves, hip packs, are available for rent as well. Call the Bike Shop number for details.” Phone is: (307)545-4825. What I’ve been wanting to do ever since walking five or six miles each day to see geysers has become more of a chore than a pleasure is to rent a bike to cover the distance from the settled part of Old Faithful out past predictable Castle, Daisy, and Riverside geysers to Fan and Mortar (which is erupting every few days so far this summer). Now it’s a possibility even if you arrive in an airplane or don’t want to put bikes on your car for a long road trip. Here are some details: Every day between June 1st and September 30th this summer  you can rent adult bikes for $8.00 an hour, $25.00 for a half day, or $35.00 for a full day, and child bikes for less. 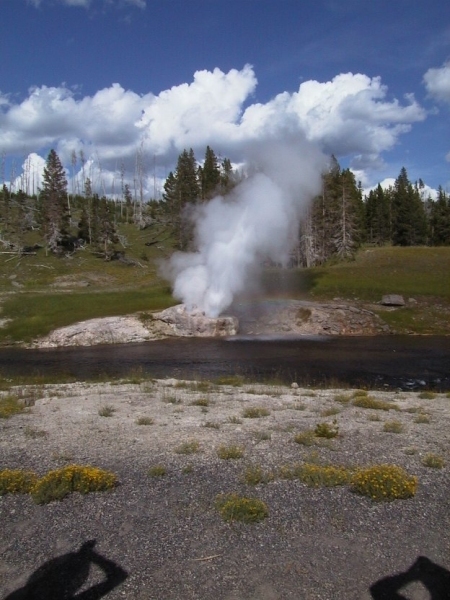 There are several pleasant places to bike from Old Faithful besides the Geyser Route Two that I write about in Yellowstone Treasures (pages 98-102). However, some rides would require putting bikes on a bike rack on your car unless you ride on the Grand Loop Road—which I don’t really recommend.